India, being a culturally diverse and fervent society, celebrates various holidays and festivals. There are many national holidays in India: Republic Day on 26 January, International Workers' Day on 1 May, Independence Day on 15 August and Mahatma Gandhi's birthday on 2 October. 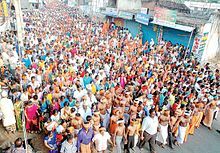 States have local festivals depending on prevalent religious and linguistic demographics. Popular Hindu festivals of Makar Sankranti, Maha Shivratri, Onam, Janmashtami, Saraswati Puja, Diwali, Ganesh Chaturthi, Raksha Bandhan, Holi, Durga Puja, Dussehra and Diwali; Jain festivals are Mahavir Jayanti and Paryushan; Sikh festivals like Guru Nanak Jayanti and Vaisakhi; Muslim festivals of Eid ul-Fitr, Eid ul-Adha, Mawlid, Muharram; Buddhist festivals like Ambedkar Jayanti, Buddha Jayanti, Dhammachakra Pravartan Day and Losar; Parsi Zoroastrian holidays such as Nowruz, and Christian festivals of Christmas and Easter as well as days of observances such as Good Friday are observed throughout India. National holidays are observed in all states and union territories. People celebrating Holi in Delhi. 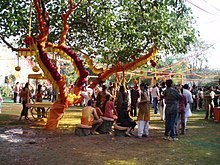 Hindus celebrate a number of festivals all through the year. Hindu festivals have one or more of religious, mythological and seasonal significance. The observance of the festival, the symbolisms used and attached, and the style and intensity of celebration varies from region to region within the country. A list of the more popular festivals is given below. Holi (Aka, Dol) All states and territories except Kerala, Nagaland, Mizoram, Goa, Pondicherry, Tamil Nadu and Bangalore. Hanuman Jayanti Maharashtra, Odisha, Karnataka, Uttar Pradesh (as Bada Mangal), Andhra Pradesh and Telangana. Raksha Bandhan (Aka, Rákhi Púrńimá) Andhra Pradesh, Karnataka, Gujarat, Madhya Pradesh, West Bengal, Rajasthan, Uttarakhand, Uttar Pradesh, Jharkhand, Bihar, Haryana, Odisha, Punjab, Maharashtra, Telangana. Bhai Duj (Aka, Bhau-beej, Yama Dwitiya, Bhai Phota) Maharashtra, Goa, Uttarakhand, Uttar Pradesh, West Bengal, Madhya Pradesh, Bihar. Vishwakarma Puja Odisha, Bihar, West Bengal. 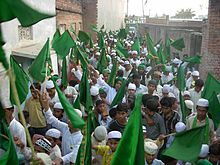 Mawlid or Eid-e-Milād-un-Nabī being celebrated in a town in Uttar Pradesh. Day of Ashura 10th Muharram. Death of Imam Hussain ibn Ali All States & Territories. Prophet Mohammad's Birthday Rabi' al-awwal All States & Territories. A number of Sikh holidays are Gurpurbs, anniversaries of a guru's birth or death; marked by the holding of a festival. 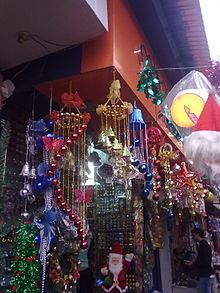 Shops selling Christmas decorations in Kolkata. A "mother to the poor"
Note: The Parsis in India use a Shahenshahi calendar, unlike the Iranians who use a Kadmi calendar. The North American and European Parsis have adapted their own version of the Fasli calendar. This is however looked down upon by many of the Parsis in North America, who continue to use the Shahenshai calendar. These differences cause changes in the dates of the holidays. For example, the Zoroastrian New Year falls in the spring for the Iranians but in the summer for the Parsis. Guru Ravidass Jayanti Chandigarh, Haryana, Himachal Pradesh, Punjab, Delhi, Rajasthan, Jammu & Kashmir, Bihar, Uttar Pradesh, Assam, Madhya Pradesh. While having so many government holidays is in line with the idea of peaceful co-existence of all religions, there have been demands from various public bodies that the system of a multitude of religious holidays is hampering economic activities to a great extent. The past two Central Government Pay Commissions  have recommended the abolition of all Central Government holidays on religious festivals, and instead, substituting them with the three national holidays, i.e., Independence Day (15 August), Republic Day (26 January) and Gandhi Jayanti (2 October). Increasing the number of restricted holidays (optional holidays), depending on one's religious persuasion, from the existing two to eight was also proposed, the rationale being that eight holidays can more than cater to the festivals of any particular religion. So, there is no point in having more than that number of holidays since religion does not warrant a Hindu to celebrate Eid or a Muslim to celebrate Diwali. With the proposed system, however, it was left to the individual to choose which eight holidays to celebrate, irrespective of his religious belief. This recommendation has not been accepted by the government of India, fearing a loss of popularity, thus the Indian government continues with an unusually large number of religious holidays as compared to most other countries. In addition, local administrations also issue a list of holidays known as local holidays, which are observed at the district level. The Ministry of Personnel, Public Grievances and Pensions (Department of Personnel and Training) on behalf of the Government of India issues a list of holidays to be observed in central government offices during the year. The list is divided in two parts i.e. Annexure I & Annexure II. In addition to the 14 compulsory holidays mentioned in para 2, three holidays are chosen from the list below by the Central Government Employees Welfare Coordination Committee in the State Capitals (if necessary, in consultation with Coordination Committees at other places in the State). The final list is applied uniformly across all Central Government offices within each State. They are notified after seeking the prior approval of this Ministry, and no changes can be made thereafter. No change is permissible in regard to festivals and dates. Annexure II also known as Restricted holidays, consists of a list of holidays which are optional. Each employee is allowed to choose any two holidays from the list of Restricted Holidays. The Coordination Committees at the State Capitals draw up a separate list of Restricted Holidays, keeping in mind the occasions of local importance, but the nine occasions left over, after choosing the three variable holidays in para 3.1, are included in the list of restricted holidays. Central Government Organisations, which include industrial, commercial and trading establishments, observe up to 16 holidays per year, including three national holidays, viz. Republic Day, Independence Day and Mahatma Gandhi's birthday, as compulsory holidays. The remaining holidays/occasions may be determined by such establishments/organisations themselves, subject to para 3.2. 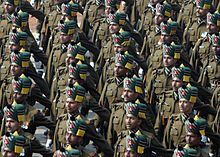 Union Territory Administrations decide the list of holidays based on Ministry of Home Affairs letter No.14046/27 /83- GP-I dated 15 February 1984, by which they observe a total of 16 holidays, including the three National Holidays, viz. Republic Day, Independence Day and Mahatma Gandhi's birthday. In respect of Indian missions abroad, the number of holidays is determined in accordance with the instructions contained in the Department of Personnel and Training's O.M. No.12/5/2002-JCA dated 17 December 2002. They have the option to select 11 (eleven) holidays of their own only after including the three National Holidays and Diwali, Milad-Un-Nabi or Id-E-Milad, Mahavir Jayanti, Idu'l Fitr, Dussehra (Vijaya Dashami), Guru Nanak's Birthday, Christmas Day as compulsory holidays falling on weekdays. In respect to banks, the holidays are restricted to 15 days per year in terms of the instructions issued by the Department of Economic Affairs (Banking Division). ^ a b c d e f g h i j Holidays to be observed in central government offices during 2017 Note a new version of this document is released each year, and old versions may not be available beyond one or two years previous. This article incorporates text from this source, which is in the public domain. This page was last edited on 22 April 2019, at 01:58 (UTC).